First thing� BREATHE� IT WILL BE OKAY! Hearts pounding, muscles burning, lungs gasping for air, feel the drive to get to the finish line and what an accomplishment when completed!� Here are some tips to keep in mind when everything we train for doesn�t go as expected when it matters the most, where every second counts.� Don�t worry even if you think you have trained for it all, we have you covered for when things don�t go as planned. 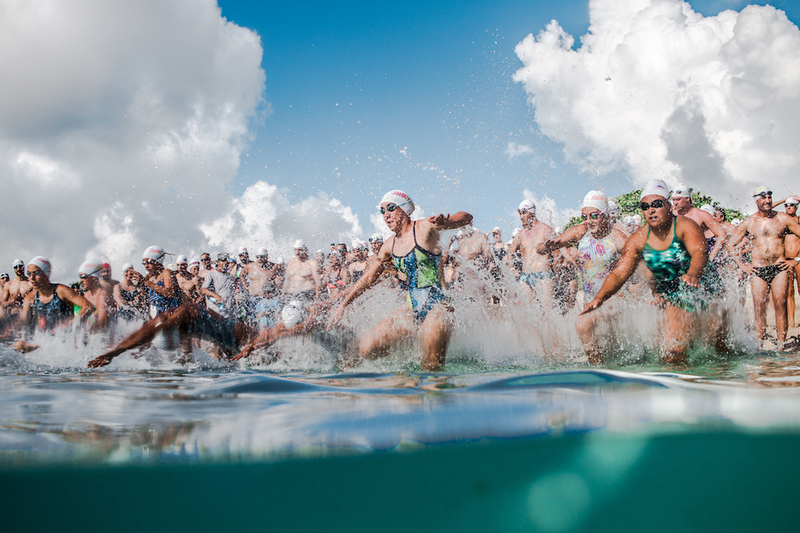 How many time have you been in a crowded ocean swim and had your goggles knocked right off at the start? 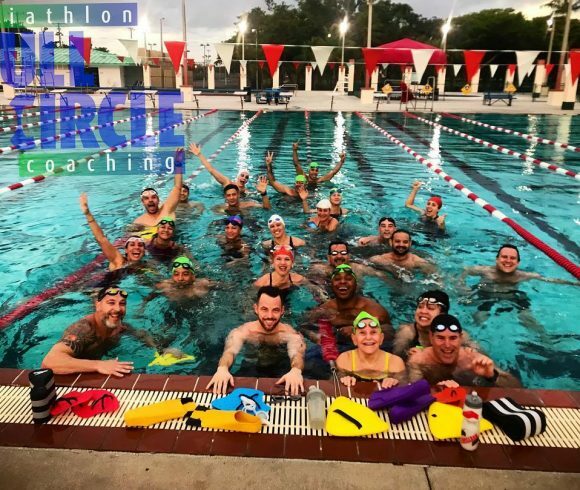 Easy fix� place the goggles on then swim cap over.� Having the cap just below the hairline keeps the pressure off the goggles, straps secured and allows for the air tight seal goggles are designed for. If your goggles DO however keep coming off, remember to move out of the way for the other swimmers. Focus on taking your time putting your goggles back on, keeping that air tight seal, chances are you will have to stop to adjust them again, if not put on tightly.� They should fit snugly enough to create a suction seal. Nothing worse than getting salt water in your eyes� try spitting in your goggles! Sounds CRAZY right? !… but it works and is the easiest solution at hand in the middle of the ocean. It�s Florida� the weather is unpredictable. You show up and the water is choppy.�� You don�t want to get a mouthful of water every time you go to breathe, so remember to breathe away from the side chop.� Practice bilateral breathing ahead of time, so when needed it feels natural to breathe on weak side if waves are coming from side you are more comfortable breathing on.� Try to make every breath count! Right before coming up for air, exhale all of the air in your lungs, so when you come up for air, you’ll be able to breathe in more quickly. Switch up your swimming stroke for energy efficiency, if needed. Stay ahead of muscle cramps. Dehydration is the leading cause for muscle cramps.� Make sure to stay hydrated the night before and morning of the race. Two days prior to swimming, you should avoid caffeine, alcohol and sugars as much as possible as they cause dehydration. 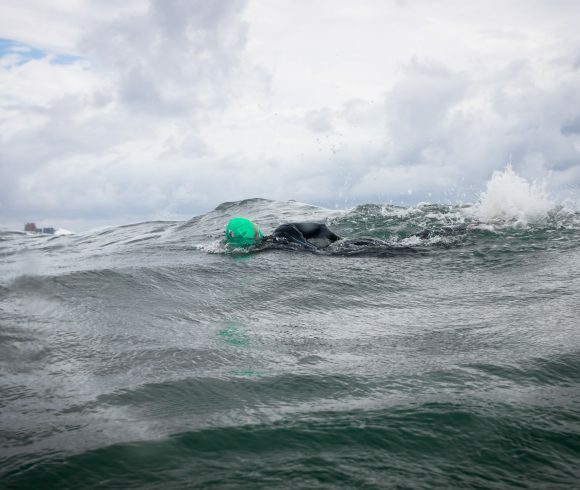 Drink a few cups of water several hours prior to your swim, and another cup 30 minutes before you start swimming. You may ask yourself water or sports drink? Water is the best choice to replenish lost fluids, however, if you swim at a high intensity level for 45 to 60 minutes, sip on a sports drink instead. Sports drinks contain electrolytes, which water does not, to be able to replenish sodium loss, but also has added sugar and calories. It is important to properly warm your body up before you jump in the water. As swimming is a total-body workout, try to stretch and activate the major muscle groups. Warm-ups are an essential race preparation for the body to perform improvements in power, agility, strength, muscle endurance and flexibility. You want to engage in dynamic stretching (engages range of motion for sport) BEFOFE swimming. Do a light jog, maybe two minutes’ top, until you feel warm, but not drenched in sweat, or fatigued� stop and stretch. The idea is to get your heart rate up above normal and keep it sustained above prior to competition, to keep your muscles warm and ready to go! If water or air temperature is cooler, it�s going to take longer for your muscles to warm-up, so keep that in mind. Static stretches, which requires holding a stretch for 10 or more seconds without moving should be completed after the race to cool down the muscles. No matter what happens, remember�just keep swimming, you got this!